This beer pours a gorgeous deep red amber with a light tan head. The head is whipped and lovely, but fades all too quickly, leaving splashy lace on the sides of the glass. The color of this beer could easily be the hue of a maple leaf fluttering in the cool autumn air. The aroma is sweet, rich and spicy. There is a nice cherry/cider sort of character to the malt that is quite inviting. Notes of cinnamon and clove are also present, as is a little bit of nutmeg. There is a faint hint of maple, and as it warms a touch of alcohol comes out. The flavor is quite well balanced with a big fruity malt profile. Cherries, tart apples, raisins and brown sugar are all flavors in the sweet aspect of the nose. Clove, cinnamon nutmeg and allspice play off of this sweetness. There is an interesting sort of starchy sweetness here that I can only assume are coming from the yams. Not at all like a pumpkin, but not like any sort of malted grain character either. The mouthfeel is on the full side of medium, with a good amount of carbonation. It finishes quite balanced between sweet and dry, leaving spicy notes on my tongue. Pretty tasty and drinkable, especially for style. If I had a complaint, it would probably be that this beer does not taste quite as exciting as the ingredients might lead you to think it would. Still, it is a well made beer with some great flavors, and for that I tip my hat in the Bruery's general direction. Pours a surprisingly light brown from the bottle, but settles into a darker, copper-tinged brew in the glass. Translucent and slightly hazy, and topped by a large light cream colored head. Very good retention and nice lacing. The colors themselves certainly evoke Fall. Big, sweet aroma, shot through with tons of spicy Belgian yeast. Cinnamon and nutmeg; maple syrup and cedar; sweet potatoes and brown sugar. Now it looks and smells like Fall in a glass. Flavor follows: despite not being a pumpkin beer, it's quite similar to most pumpkin brews, as the same spices dominate the brew, followed by a slightly sour woody lacing, sweet and spicy Belgian yeast with a touch of must, and light brown sugar and caramel. 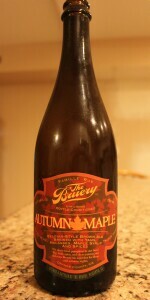 It's more complex than most Fall brews, but similarly spicy and sweet. Lively and sticky; moderately full bodied, surprisingly. Pretty drinkable, but sticky enough to make it a slow sipper. This is a very different take on a Fall beer, yet simultaneously familiar. The Belgian yeast provides the biggest departure. From the local watering hole on tap. Pub Pint. One taste and I ordered a growler to go. It was like I walked into our local apple orchard store and someone hit me in the face with a pumpkin pie and dozen apple crisp donuts. Then told me it wasn't made from either. Not a big fan of the fruit and veggie beers. I was really surprised at how well this beer was done. Pumpkin, sweet potato, ginger, brown sugar, maple all the wonderful smells of fall. A must have for anyone who likes the pumpkin style beers, perfect for autumn. On draft. 4 ounce pour in mini-snifter. Appearance: Brushed copper with a thin ring of foam. Smell: Smells like fall. Nutmeg and pumpkins. Imagine a pumpkin pie before it’s thrown in the oven. Taste: Sweet caramel, nutmeg, allspice, with a little whiskey bite at the end. I love the soothing warmth it leaves. Like a liquid blanket on a cold day. Mouthfeel: Sweet, smooth, and soft. Overall: I love fall beers and this is one of my favorites. It’s not just pumpkin spices thrown into a brown ale and distributed for the season… it’s carefully crafted to compliment this time of year. Well done. Reviewed solo on 11/10/09 served out of a short snifter glass at the gingerman nyc. Appearance:slightly cloudy blood ruby/ with hint of amber with little head. Taste: opens with intense malts, spicy and an earthy tanginess which mellows out at the middle as an alcoholic earthy almost pumpkin but more yam like profile come in after the middle as a less intense and tangy profile returns at the finish leaving a malty, tangy and vegetable aftertaste. Mouthfeel: light to medium bodied at most with moderate carbonation and slighty coarse all throughout. Drinkability: I would definitely have this again, it reminds me of a cross between southern teir pumpkin and leviathan quad. I recommend this to someone who opens with an intense malt profile with tangy and spiciness which workd well as an earthy middle emerges with the malt and tangy profile finish. Served from tap into a snifter. Poured dark brown with a subtle red hue with a one finger light tan head. Maintained decent lacing throughout the glass. The aroma was comprised of sweet malt, bread, and a slight sour note. The flavor was of sweet malt, slight sour, nutmeg, and slight burnt malt after swallowing. It had a light feel on the palate with mild carbonation. Overall this one was pretty good. Probably one of my favorite seasonals I've had this year thus far. Very nice aroma going on here with a nice complex flavor to follow it up. A definite must try. I give this 4 across the board. Pours a cloudy dark muddy amber. Smells great. Just the name alone gets me excited about trying this beer. Plus I have not had anything from Bruery that I have not liked. Smells of cinnamon, cloves, nutmeg I want to say pumpkin because of the accompanying spices but I know it is yams because of what I have read. Very sweet and yet a little kick from the spices in it. Definite tastes of cinnamon and nutmeg. Very nice blend of spices and sweetness. I like a good Octoberfest and this one comes through. Great mouthfeel . I am only having have of this bottle tonight. I will re-cork it and finish it tomorrow. Not sure of the ABV but the sweetness of it makes it a sipper and I generally guzzle beer and don't sip it. 750mL bottle. Pours a murky brownish orange with a 1/4 inch of head. The aroma is lots of the Belgian yeast. Cloves, coriander, nutmeg and a hint of cinnamon. The taste is more of that Belgian yeast upfront followed by lots of spices. Nutmeg, allspice, cinnamon and coriander. Banana and some dark fruits. Not picking up on much yams or maple syrup. Yeasty finish. Medium bodied with a mild alcohol presence. I'm not a pumpkin fan so I appreciate the change on this one but I'm not digging it all that much. Overall, I won't be buying this again. Appearance - Dark brown/tan with a monster 4+ inch head and tons of foamy, sticky lacing. Smell - Roasted malts, sweet potato, maple sugar, brown sugar, molasses, cinnamin, nutmeg, lots of other spices. Some alcohol, yeasts and some dark fruits. Taste - Much like the smell, load of yams at first sip. Lots of cinnamin, nutmeg, allspice and all the added sugars mixed in with the yams. Alcohol adds some warmth too all the thanksgiving day flavors this beer has. The yeasts add a sour note, espically at the finish. Mouthfeel - Tounge gets the yams and spices, and alcohol. Loads of sugars and yeasts also. Palate gets yams, spices and sugars also, with a sour note from the yeast. Afertaste is warm, yammy, spicey and malty. Overall - A nice big beer. If you enjoy sweet potato and all the spices this beer has then this is a must try. I was worried it would be too over the top with everything in it but its balanced well, and all the flavors work well and just add nice flavors. Only thing is this bottle is a bit much to drink by yourself so make sure you split it with someone. The bruey is kind of like the west coast verison of dogfish head, but there beers are very well balanced and there unique flavors work well together. Worth a drink for sure.